My first week working at EverGreene Architectural Arts, I was tasked with researching churches in Pennsylvania. I was dismayed to learn that many of the churches were closing down. Declining populations combined with the recent church scandals and a general decline in religious beliefs led to the decay and neglect of these beautiful, historic, churches that once instilled civic pride. These grand churches had once served more than just a sacred worship space, they were the lifeblood of their communities, and I read that now many of them are being shuttered and destroyed. It was disheartening reading about this, and as I pored over articles, I learned more about the decline of rural towns in the United States in general, about former boom towns that had gone bust, about places and people whose lives were still greatly impacted by the 2008 recession. Last week I was in Austin, Texas, attending the League of Historic American Theaters (LHAT). I sat in on panels and learned how theaters were re-vitalizing small towns and cities across America. 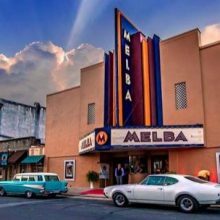 In particular, during a panel called, “A Very Melba Christmas,” I listened to the story of how four people in Batesville, Arkansas joined together to save the cherished Melba Theater. They galvanized their community and did most of the hard work and repairs to the theater themselves. Their work paid off, and this Christmas they had upwards of 20,000 people visit their theater. I also learned about the Columbia Theatre in Louisiana, which rose to the challenge of shaping its community’s identity after the football program was closed down. Roy Blackwood, spoke on a panel about how football is the heart of Southern towns and communities, and after the program was closed down the Columbia Theatre shaped itself to serve as a cultural beacon so that residents had a place to go on Friday nights. 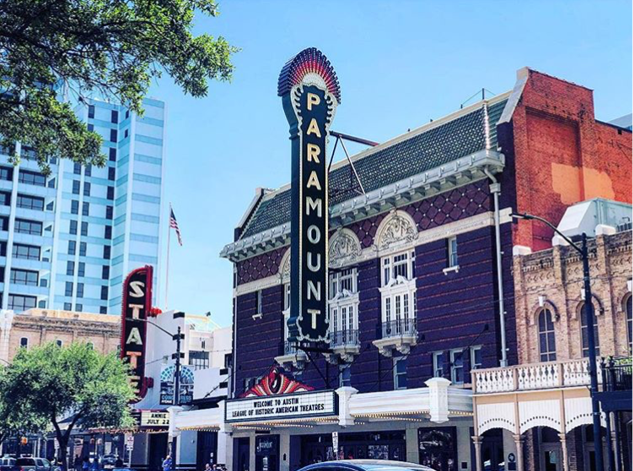 On the last day of the conference, all of the conference members were brought to the beautiful Paramount Theatre in Austin, right on Congress Ave. As we pulled up in front of the theatre, the blade lights were flashing and there was a Marilyn Monroe posing. 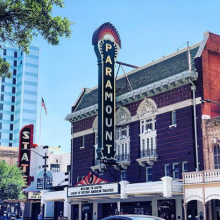 They greeted us with warm, genuine smiles, served us popcorn and sodas and we learned from the leaders of the Paramount how they have worked hard to restore the theatre to its former glory. What was striking about the stories we heard here, as well as the other stories we heard all weekend, was how passionate and purposeful the speakers felt about their theatres and the work that they do. While churches and other institutions might be shuttering their doors, it gives me hope to know that theaters across America are being restored and revitalized and bringing communities together that is inclusive and welcoming for everyone.